Born in 1601 in Leiden, near the western coast of the Netherlands, Rembrandt Harmenszoon van Rijn was a Dutch painter and etcher whose work dominated the Dutch Golden Age. Today, Rembrandt is best known for his evocative portraiture, Biblical illustrations and historical scenes. He developed his eye and skill for drawing, painting and etching alongside each other, thus achieving a well-rounded and developed body of work. His impressive works exhibit a masterful handling of light and shadow that often suggest deep human emotion and spiritual transcendence. 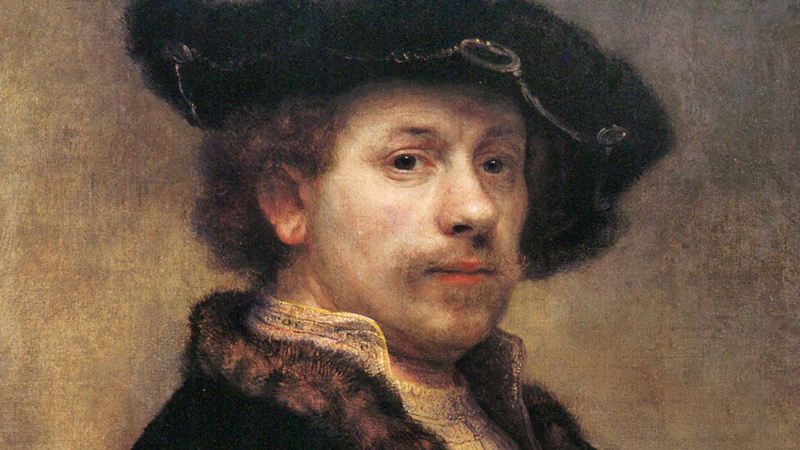 Rembrandt’s “Self Portrait at the age of 34”, 1640. Etching often became the preferred medium of painter-engravers due to the higher flexibility and control the medium allowed – compared to liquid mediums, etchings allow corrections, more detailed lines, and more variation in line weight. Rembrandt himself utilized the medium to great lengths, often breaking new ground in techniques and methods. His masterful use of light and shadow is especially apparent in the monochromatic works. 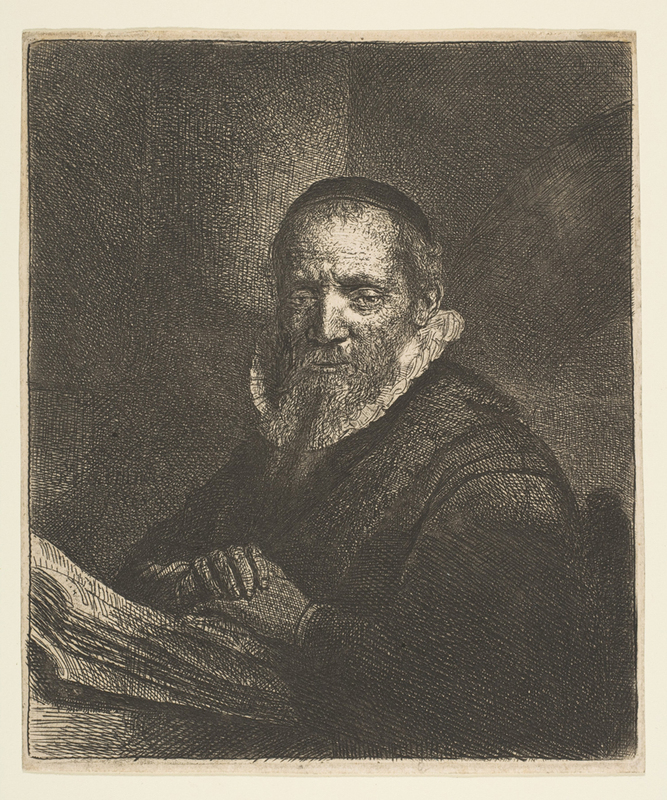 Rembrandt’s earliest etching in our collection, Jan Cornelis Sylvius, preacher (1633), illustrates the portrait of Jan Cornelis Sylvius, a minister in the Dutch Reformed Church and mentor to Rembrandt’s wife, Saskia van Uylenburgh. Rembrandt’s depiction of the minister captures a quiet, reserved character and a pensive expression, while the rendered light in the work suggests spiritual depth and wisdom. Rembrandt, Jan Cornelis Sylvius, preacher, (1633). Etching. 6.75 × 5.75 inches. 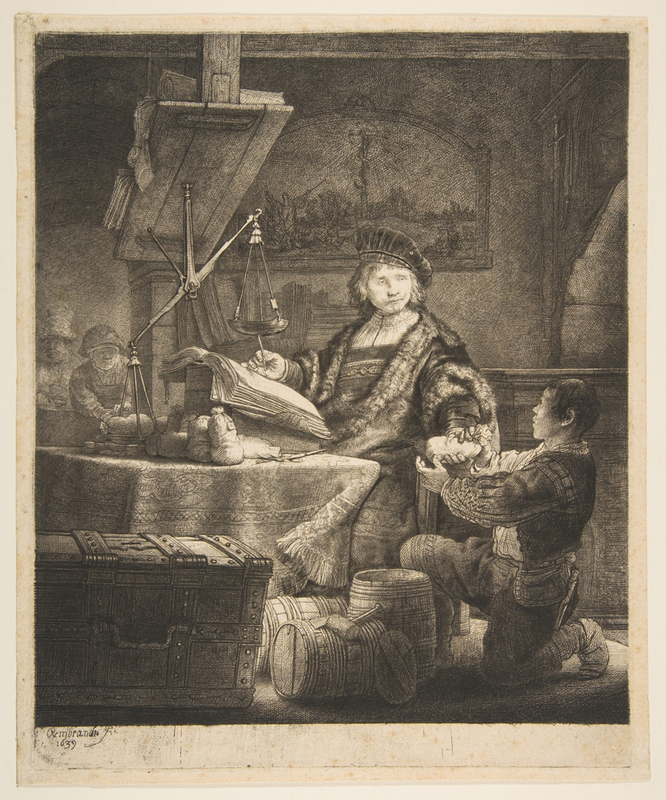 More detailed and complex, the 1939 etching Jan Uytenbogaert (The Goldweigher) depicts the artist’s friend, a debt collector and patron of the arts, receiving payments. 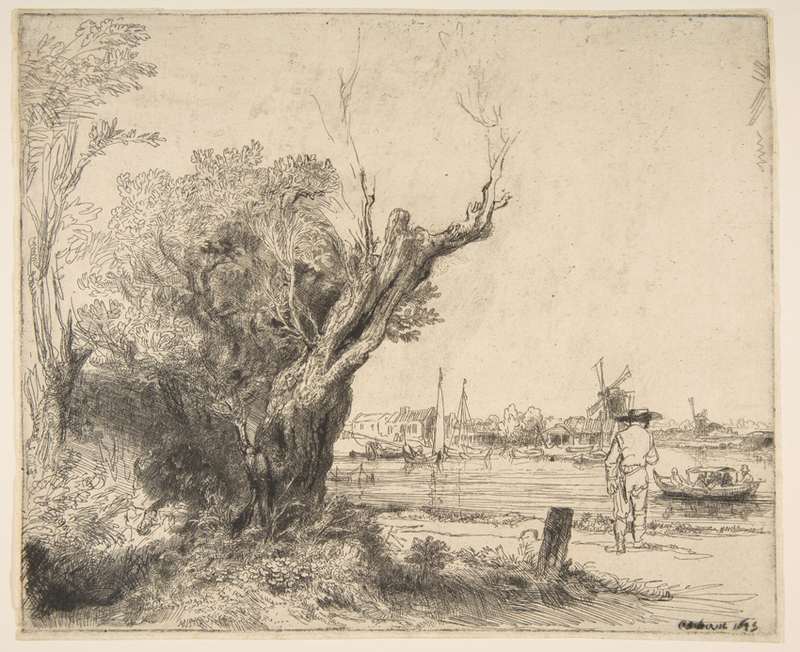 Rembrandt uses delicate, controlled crosshatching to render fine details, textures and shadows. Rembrandt, Jan Uytenbogaert (The Goldweigher), (1639). Etching. 10 × 8.5 inches. The master’s later etching, The Omval, demonstrates a looser, more relaxed hand. Comfortable and confident marks in the foliage and receding architecture highlight the artist’s skill and artistic wisdom. The viewer can almost step into Rembrandt’s head when looking at this etching – certain tight and detailed renderings trail off into loose, flowing lines like lost trains of thought. Like in the above works, The Omval employs light – or the lack thereof – to fully render out its story. In the shadows of the trees, covered by layers of crosshatching, two lovers hide amidst lush foliage – giving this pictorial etching another layer of humanity. Rembrandt, The Omval, (1645). Etching. 7 7/16 × 9 inches. To view Rembrandt’s works in person, contact gallery nearest you to arrange a private viewing.